Kurt Vonnegut is an American author who wrote a number of books and short stories. Slaughterhouse-Five is simply the most well-read. There are other books by Kurt Vonnegut that you should read, basically because of his style. He tends to write as if sitting across the table, speaking directly to you. He avoids harshness, despite writing about very painful topics, he always sprinkles a bit of humour or fantasy to offset the pain. His linguistic style is described as straightforward; his sentences are concise, his language simple, his paragraphs brief, and his ordinary tone conversational. Kurt Vonnegut uses this style to convey complex subject matter in a way that is intelligible to a large audience. Slaughterhouse-Five was his greatest work. It is based on Vonnegut’s own experiences during World War II when he was a prisoner of war. On February 13, 1945, Dresden was the target of a fierce fire bombing by the Allies. Vonnegut as a prisoner of war, was engaged in forced labour in the city. He and his fellow prisoners were billeted in Slaughterhouse Five, that is the title of the book. The fire bombing lasted until February 15, leaving tens of thousands of Germans dead. When Kurt Vonnegut and his fellow prisoners emerged from where they had hidden, (in a meat locker three stories underground) they were astounded by the level of both the destruction in Dresden, the death, and the fact it was to be kept secret. In the Book, Vonnegut describes what he saw and experienced, but not in a depressing or harsh manner. Kurt Vonnegut and other American prisoners were put to work immediately after the bombing, excavating bodies from the rubble. But the book is not gruesome nor depressing. 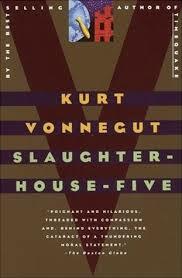 Slaughterhouse-Five was released in 1969, at the height of the anti-war movement, and rocketed Kurt Vonnegut to fame. The story is not told in a linear fashion, and to alleviate the painful and repulsive theme there are many fantastic sprinklings such as his kidnapping by aliens from the planet Tralfamadore. Many of Kurt Vonnegut’s earlier works had appealed to college students. The strong antiwar message of Slaughterhouse Five resonated with those marked by the Vietnam War.